It's always interesting to find out if a superstar athlete is able to pass on those innate abilities and skills to his or her child. In basketball, it has been proven that for every LeBron James, Jr., there is a Marcus Jordan—meaning not every NBA legend produces an offspring who is as gifted. Retired Laker great Kobe Bryant may have yet to be blessed with a bouncing baby boy, but his hoops genes are strong with at least one of his three daughters. 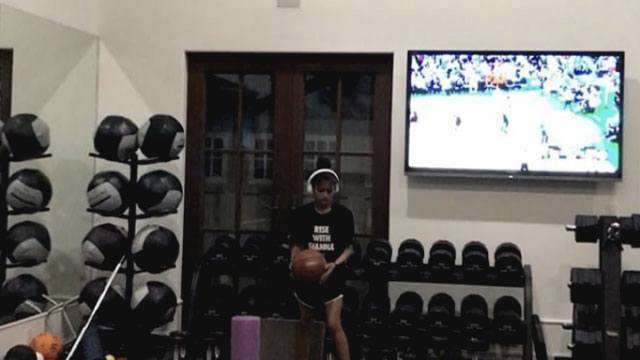 Recently, the Black Mamba shared an Instagram video of his middle child, Gianna Maria-Onore, busting out a familiar move in the gym. Aside from producing documentaries and slam poetry, it looks like Kobe has been using his break to make sure that his spawn is on the right path to greatness. While still waiting for Kobe, Jr., 'Lil Mamba' right here is looking to conquer the WNBA.